Dynamite Announces Limited-Edition Seoni Statue! Our friends at Dynamite have announced a Kickstarter to produce a resin statue for everyone's favorite sorcerer, Seoni. But this campaign isn't just for one statue... they're offering THREE limited-edition variants to add to your Pathfinder collection! Will you choose the Spellcasting Edition, which shows Seoni preparing to unleash a devastating spell? Maybe the Battle-Ready Edition, complete with dagger and staff at the ready, is more your style. For even more customization, there's a Kickstarter-exclusive, unpainted version that allows you to create your own unique look. From the intricate tattoo designs to the hand-painted accessories, this highly detailed status is a fitting tribute to one of Pathfinder's most celebrated iconic characters. 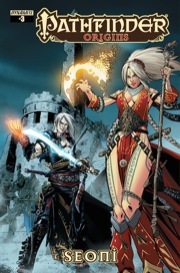 For those looking to complete their collection of Pathfinder graphic novels, Dynamite has included add-ons for both digital and print copies at a great value. They're even offering backers a chance to get the Pathfinder Campaign Setting: Sandpoint, Light of the Lost Coast signed by Pathfinder Creative Director James Jacobs. Dynamite's Kickstarter for this limited-edition masterpiece is going on now, so don't delay! Their magical blood gives sorcerers their spellcasting power, and it's been a major part of the class since Pathfinder's inception. So for the Pathfinder Playtest, we're going all in: your character's bloodline determines her spell list! You pick your bloodline at 1st level, which tells you which spell list you use: arcane, divine, primal, or occult (the last of the four magical traditions, which we'll cover in a future blog!). It also defines some of the spells you know. For instance, the demonic bloodline gives you the divine spell list and the fear spell at 1st level, in addition to two other spells that you choose yourself from the divine list. In some cases, the special spells from your bloodline come from other lists. For example, the demonic bloodline gives you slow when you learn 3rd-level spells (for the sin of sloth) and disintegrate when you learn 6th-level spells. There are a couple more. How about we look at that whole bloodline entry and you can make your own guesses about which ones are from other lists? The demons of the Abyss debase all they touch, and one of your ancestors fell victim to their corruption. You're burdened with dark thoughts and the desire for destruction. This urge can be overcome if you choose to fight it, but the beauty of sin calls to you always. You can see that the bloodline also determines your most important skills and gives you some bloodline powers. We've talked about powers before (see the cleric preview. These are special spells you can get only from specific classes, and they are cast using Spell Points rather than spell slots. They also automatically heighten to the highest level of spell you can cast. You start out with a number of Spell Points per day equal to your Charisma modifier, and if you have the demonic bloodline, you gain the glutton's jaws power, which you can cast at a cost of 1 Spell Point. Your mouth transforms into a shadowy maw bristling with pointed teeth. These jaws grant you an unarmed attack you're trained in, dealing 1d6 piercing damage. They have the finesse trait. Attacks with your jaws have the following enhancement. Enhancement If the target was living, gain 1d4 temporary HP. Heightened (2nd) Your jaws gain the effects of a +1 weapon potency rune (a +1 item bonus to attack rolls and an additional damage die) and the temporary Hit Points increase to 2d4. Heightened (4th) The jaws gain the effects of a +2 weapon potency rune and the temporary Hit Points increase to 3d4. Heightened (6th) The jaws gain the effects of a +3 weapon potency rune and the temporary Hit Points increase to 4d4. Heightened (8th) The jaws gain the effects of a +4 weapon potency rune and the temporary Hit Points increase to 5d4. At higher levels, you'll get to make a swampy morass that makes creatures slothful or call forth the dangers of an Abyssal realm. The number of bloodlines in the Pathfinder Playtest Rulebook is fairly small, since we want to see how people react to the new style of the class with just a subset of the bloodlines. In the book, you'll see the following bloodlines: aberrant (occult), angelic (divine), demonic (divine), draconic (arcane), fey (primal) and imperial (arcane). That last one comes from the magical traditions of ancient mortals and matches our iconic sorcerer, Seoni! This is our first preview of a spontaneous spellcaster! The sorcerer gets the same number of spells per day as a wizard, but she has a number of spells she knows permanently instead of preparing them from a spellbook every day. The spells she knows make up her spell repertoire. That means she can choose which spell to cast each time she casts a spell instead of needing to plan ahead. It's worth noting that the sorcerer now learns spells at the same character level as the wizard: 2nd-level spells at 3rd level, 3rd-level spells at 5th level, and so on. As you level up, you learn new spells and can replace some of the spells you previously had with new ones. This lets you get rid of some spells that were great options when they were at your highest level but maybe aren't worth casting anymore. The sorcerer's spellcasting is based on her inborn magical potency, so she uses her Charisma for her spell rolls and spell DCs. Because Charisma also adds to Resonance Points, the sorcerer can make up for some of her limited spell choice compared to the wizard's spellbook by supplementing her spell selection with more scrolls, staves, and wands. Many of the sorcerer's class features were explained under bloodline, as most of them tie back to that choice. 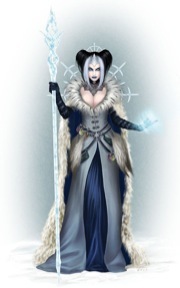 The sorcerer gains her advanced power at 6th level and her greater bloodline power at 10th level. As with other spellcasters, her proficiency with spell rolls and spell DCs increases to expert at 12th level, master at 16th, and legendary at 19th. The sorcerer gets one other class feature, called spontaneous heightening. As mentioned before, some spells in your lower-level spell slots get less useful as you go up in level. However, there are some spells you might want to cast with any of your slots. The spontaneous heightening feature lets you choose two spells at the start of each day that you can cast as their heightened versions using any of your spell slots. That means that if you want your angelic sorcerer to be able to cast 1st-level heal, 2nd-level heal, and 3rd-level heal, you can choose your 1st-level heal spell with spontaneous heightening rather than needing to learn the spell in your spell repertoire at all three spell levels. Then you can cast a 1st-level heal to top off someone's Hit Points when they're almost at full and still cast a 3rd-level heal in the middle of a fight to really save someone from the brink! The sorcerer's feats primarily deal with her spells. Sorcerers get metamagic feats, many of which they share with other casters. One we haven't shown off yet is Overwhelming Spell at 8th level, which lets a spell that deals acid, cold, electricity, or fire damage ignore the first 10 points of a target's resistance. If you want to make a blaster, you can pick up Dangerous Sorcery, which increases the damage of your spells by their spell level (with the exception of cantrips). You can also take Blood Magic at 8th level, which uses the magical potential in your blood to grant temporary Hit Points to you or a target of your spell if you're bleeding when you cast it. One of my favorite cycles of feats are the evolution feats, which reinforce the themes of each magical tradition. Arcane Evolution makes your arcane sorcerer trained in a skill and lets you add a spell from a scroll to your spell repertoire for the day when you prepare each morning. Divine Evolution lets you channel energy like a cleric. Occult Evolution gives you a skill and lets you pick a spell with the mental trait to add to your repertoire each day. Finally, Primal Evolution lets you cast summon nature's ally as an innate spell once per day at the highest spell level you can cast. How about a 20th-level feat? Sorcerers can take a feat to gain 10th-level spells of their tradition, but you might want to look at other options, like Wellspring Spell. This metamagic feat lets you cast a 5th-level or lower spell once per minute without expending the spell slot! What sort of predictions do you have for the bloodlines? What spells will they get? Does this new scheme make you more or less likely to play a sorcerer? Do you want to try out a gnome fey sorcerer? How about an angelic sorcerer with the heal spell? Let us know in the comments, and start preparing for when you get the book! Iconic Heroes Set #1 Final Photos! It's a rainy Friday here in Washington state, but my spirits are high above the darkened clouds thanks to a very special package that arrived from our partners at WizKids this week. The simple cardboard box contained a single "final" version of Pathfinder Battles Iconic Heroes Set #1, the first in a series of monthly non-random iconic character sets that hit stores in January 2015. The Iconic Heroes sets are a response to fan demand for several different products. 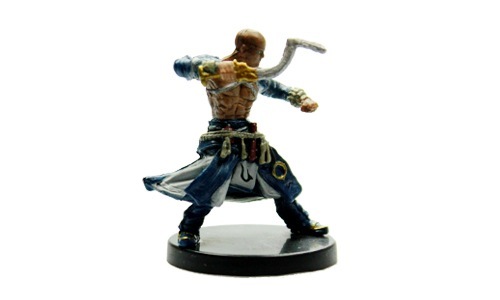 Customers always—always—want nonrandom prepainted figures. The expense and nature of the prepainted plastic figure business usually precludes this, but the strong popularity of our iconic characters pushed WizKids over the line in wanting to give it a try. Players of the popular Pathfinder Adventure Card Game have long been asking for an easy way to collect iconic character figures for use as pawns in the card game. 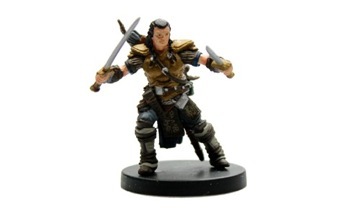 Many of the iconic heroes released in previous Pathfinder Battles sets are sold out and starting to fetch crazy prices on the secondary market. I just noticed that someone paid more than $40 for a single Amiri figure, which is absolutely nuts. Gamers want a way to get our cool iconic heroes at an affordable price. So, in January, we'll begin releasing six-figure Iconic Heroes sets to address all of the above requests. Even better, each set include six unique Pathfinder Adventure Card Game cards that won't be available anywhere else, each associated with one of the characters featured in the set. WizKids promised "premium quality" sculpts and paint application for the Iconic Heroes sets, which are also the first to benefit from the new digital sculpting process we're now using across the entire Pathfinder Battles line. Here at Paizo, we took those words to heart, and did everything we could over successive rounds of approvals to make these the most detailed, gorgeous prepainted versions of these figures ever made. I think all of us also had some ambitions to raise the bar across the board with prepainted miniatures. With the right reference art, approval team, and with concerted effort from everyone at WizKids, we knew the stars could be right for a paradigm-shifting series of figures. I am pleased to report, my friends, that it appears that everything has gone right with Pathfinder Battles Iconic Heroes Set #1, which I now hold in my hands. I'm currently comparing several of the figures to previously released versions of the same character for previous Pathfinder Battles sets. In all cases the new version is not just superior, but plainly superior. And we're talking about some of the better figures we've produced to date! I couldn't be happier with the way these figures turned out. It is my strongest hope that you guys will buy enough of them that WizKids considers the experiment a success and slates several new releases in this format above and beyond the already-announced characters. Because, really, at this stage I think we've done everything we can to make sure the product stands tall. It's all down to sales. But enough of my talking, let's let the miniatures speak for themselves! 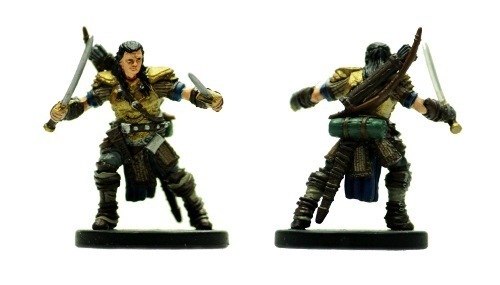 Here we have Valeros, our very first iconic character who appeared on the cover of Pathfinder Adventure Path #1, and he also has the distinction of being the very first Pathfinder Battles figure from our initial Beginner Box Heroes set. Good old Val is still figure #1 in this new line, and I think he looks better than ever before. Virtually everything about this new figure is an improvement over the existing version (which I also really liked). Sculpt wise, there are lots of new details, including a bedroll on Val's back, more accurate hair, and a cool new facial expression. A huge improvement all around. Seoni the sorcerer first appeared as a rare figure in the Rise of the Runelords set, where she swiftly sold out and became one of the most popular figures we've ever released. This was due not just to the fact that Seoni has always been one of our most popular iconics, but also because WizKids delivered with a fantastic sculpt and an excellent paint job. The new one is even better. The new sculpt is much more "three dimensional," in that her ponytails are uniquely sculpted elements (as opposed to running flat down the back of the sculpt). The same is also true of her ribbons. The main difference here is on tampo application, "stamped on" details for fine work like script and design. On Seoni these details appear on her tattoos, on the script on her ribbons, and on her girdle. Theres no way this detail will be visible in photographs, but on the new figure the amount of design detail on Seoni's girdle is INSANE. As in, so detailed my naked eye can't even fully make it out. The old version of the girdle was flat black, with no detail. Again, a huge improvement. Last up today is our iconic monk Sajan, who first appeared in the Legends of Golarion set. Again, as an iconic character, the original Sajan figure looked pretty good in the first place. There were some complaints that the ties for his sleeves drooped down over his chest, making it look a bit like a bra, but other than that, he has a cool pose and looks very much like the art that inspired him. It won't surprise you to learn that I think the new figure is better. Much better. The pose is far more three-dimensional, and I'm pleased to report that the sleeve tie tassels are no longer an issue, and the new Sajan is bare-breasted, just like God (and Wayne Reynolds) intended. 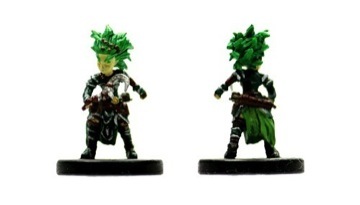 So far, Pathfinder Battles Iconic Heroes Set #1 is 3 for 3. Swing by next week for a look at the next three figures! I've already spoken at length about our plans for the monthly series of Iconic Heroes Boxed Sets that begin in January. I've mentioned that WizKids intends to produce these figures at the highest possible standards, with premium sculpts and paint jobs. I've even shown digital sculpts of some of the new figures. I've mentioned how digital sculpts give us as Paizo a lot more opportunity to ensure that details are exactly right (we just sent 17 sculpt comments for a single figure yesterday). But until now, all you've had beyond digital renders is my word that they're going to be awesome. That changes today, as I reveal the paint masters for three figures from Iconic Heroes Set #1, the very first set that will hit in January 2015. WizKids factory painters will do everything they can to replicate these paint jobs exactly, so these figures should be an excellent preview of what you can expect from the final production run. They are, however, missing some finishing details. Super-detailed work like complex patterns on clothing and pupils are applied via a stamping process called a tampo during the production run, so these elements often do not appear on paint masters. Try to imagine Seoni's tattoos and some of the dress detail work and you'll have a better idea of how the final figures will look. Here we have the Valeros, Human Fighter like you've never seen him before. I think the face says everything you need to know about the power of digital sculpting over traditional practical methods, and the quality of all of his little pieces of adventuring gear really pushes it over the edge. Check out that tankard! Look at the bedroll on his back! I can't wait to get this figure for my own collection. Valeros has a gnome buddy, and her name is Lini, Gnome Druid. Frankly, I really like the original Lini figure from The Lost Coast, but this one comes with a slightly more action-oriented pose and puts a little more focus on her sickle. We'll show off Lini's riding cat animal companion, Droogami, in next week's preview. Seoni has always been one of our most popular iconic characters, and was one of the originals to appear on the covers of our Rise of the Runelords Adventure Path, the very first appearance of the Pathfinder brand. Along with Valeros and several others, she stars in the Pathfinder Comics produced by Dynamite Entertainment, where she is coming into her own as the leader of the iconic adventurers. Like Lini, Seoni got a fantastic figure in an earlier set. The speed with which that figure sold out was one of the things that convinced us that we needed a better option for iconic character minis, and I think the pose on this new version is significantly more interesting than her original sculpt (which I also really liked). Of the six figures included in Iconic Heroes Set #1, Seoni has by far the most tampos still to come, but I think she's off to a great start. Iconic Heroes also includes Sajan, Iconic Monk; Seelah, Iconic Paladin; and Droogami, Lini's snow leopard animal companion. Each of the sets also includes six unique Pathfinder Adventure Card Game cards specific to the included adventurers and animals. These cards are available exclusively in Pathfinder Battles Iconic Heroes sets, and are not part of existing Pathfinder Adventure Card Game subscriptions. Swing by next week for a look at the paint masters of the other three figures in this set. In the meantime, check out the WizKids Pathfinder Battles items we've added to our annual Great Golem Sale, including Shattered Star boosters for $11.99, $10.00 off White Dragon Evolution, and more! 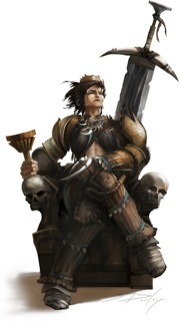 The release of Pathfinder Roleplaying Game: Ultimate Campaign is getting ever closer. Whether it's kingdom-building or leading an army, starting a business or crafting magic items, Ultimate Campaign is for all of the adventures that take place outside of the dungeon. The pages of the newest Pathfinder Roleplaying Game hardcover provide all kinds of useful information for your campaign, but many fantastic illustrations are contained within! Check some of them out! Being a ruler has many responsibilities, but also many rewards. Eidolons and other companion creatures are more fun when treated as a separate character rather than an obedient stat block. Retraining rules allow you to replace a feat, change an ability score increase, or improve your hit points. The quest to find a missing family member is a driving force for many heroes. The section on marriage talks about how a spouse (or any relationship) can be an ally or an adversary. Kingdom-building rules allow PCs to control their own country—or be the power behind the throne. Followers, apprentices, and similar companions can be positive or negative plot hooks for a PC. A character's lineage is a chain of characters linking a PC to the history of the campaign setting. Ultimate Campaign releases this May, preorder your copy today! Since we revamped our Player Companion line last August, we've been able to play with a lot of different ideas and themes in coming up with overarching concepts for the latest Player Companions. Coming up is one of our most exciting new releases in this line, a content-packed volume called Animal Archive, available starting on the 20th of February. This Player Companion is chocked full of awesome new tips, tricks, items, archetypes, spells, and feats for you and your bestial buddy. Oh, and did I mention there'd be a ton of new animal companions and familiars too? Electrolocation (Ex) While underwater, platypuses can sense the tiny electrical currents that trigger muscle movement. This allows them to locate living prey and to distinguish it from inanimate objects. Treat electrolocation as blindsight 30 feet, but platypuses can sense only living creatures, and it functions only underwater. Poison (Ex) Spur—injury; save Fort DC 9; frequency 1/round for 4 rounds; effect 1 nonlethal damage; cure 1 save. Semiaquatic (Ex) Platypuses can hold their breath underwater for up to 5 minutes before they must start attempting Constitution checks to avoid suffocation. This little guy is just one of the four new familiars you'll find in Animal Archive, and just one of eight brand-new animals total! In addition to these all-new beasties and a host of new rules options, you'll find expanded information and rules on some of Golarion's most famous endemic creatures, including the razorcrow, ether frog, firefoot fennec, and more! So dust off the old feedbag and clean out your kennel, because Pathfinder Player Companion: Animal Archive hits shelves later this month! Gen Con Pathfinder Cosplay Contest Voting! It’s that time again! Though I failed in my sacred duty to announce the Annual Gen Con Pathfinder Cosplay Contest well ahead of time, we still had a number of unbelievably strong contenders this year, and it would be a shame not to crown one of them as the winner—a title which, in addition to bragging rights, confers $50 in paizo.com store credit. So let’s get voting! Here’s how it works: Presented below are the photographs (and names, where possible) of this year’s contestants. In the comments thread for this blog, you can pick the ONE winner who you think has the most awesome Pathfinder-related costume and shout out your vote. You have until next Thursday at noon to get in your choices, after which we’ll announce the winner. Natalie (with the metal plates), Nicole the alchemist, Amy the ranger, Megan the pregnant sorcerer, Mike the cleric. Seoni stopped by to say hi! Everything She Does Is Magic! Illustrations by Alex Aparin and Roberto Pitturru. Widescreen version here. Seoni is by far one of the most popular iconics we've ever written. 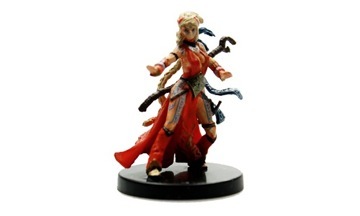 The classic high charisma sorcerer, she's graced the pages of Pathfinder products from the very beginning. Now she can grace your desktop along with Alhazra, the iconic oracle, in this Inner Sea Magic themed wallpaper. Golarion Day: The Stars Are Right! Sara Marie: Those were some delicious biscuits! Over. Crystal: This time we should say something less confusing and less likely to end with us eating biscuits. Like "Hedgehog." Sara Marie: I like porcupines better. Porcupine. Crystal: Where are you, anyway? I got lost when the cave raptors were chasing us. Hedgehog. Sara Marie: Let me turn on a light... Looks like I'm in Sarah's office. There's art all over the place. Porcupine. Crystal: She must have left in a hurry. Does it look trapped? Hedgehog. Sara Marie: I don't SEE anything that looks like a trap. Where are you? You're better at spotting traps than I am. Porcupine. Crystal: I don't know. I dropped my darkvision when that lurking ray grabbed at us. Where ever I am, smells nice! Hedgehog. Sara Marie: There's a folder marked "TOP SECRET" sitting right on top of her desk! I'm going to see if I can get a closer look. Porcupine. Crystal: No wait! The "top secret" folder is Midwestern family recipes! It's almost certain to be booby-trapped! Sara Marie: Where else should I check? Crystal: Check the refrigerator. I think that's where she keeps the special art. Hedgehog. Sara Marie: You're right! This thing is chock full of art-like pictures. Most of it seems like stuff that's already released. Porcupine. Crystal: You should see what's in the dishwasher! Sara Marie: Oooh wait! .... What's this! .... It's marked "Future Cover Art". Porcupine. Crystal: Stuff from the future, huh? Sounds neat! Open it and see if a paradox destroys us all! Hedgehog. Sara Marie: Wow! These are amazi-- ...Umm... I just heard a "click" sound. Is that bad? Porcupine. Crystal: You've either stepped on a mine, or else let her lucky cricket out of its cage. Possibly both. I'm not certain if the cricket explodes. Hedgehog. Sara Marie: PORCUPINE IS LEAVING THE NEST! REPEAT PORCUPINE IS LEAVING THE NEST! Crystal: Sara? Sara, are you okay? Sara Marie: I'M OK! COPY THAT? I AM OK! Crystal: Stop yelling or the cave raptors will find us again. Hedgehog. Sara Marie: Where ever you are... Watch out! These people know how to lay traps! On the up-side, I made it out with two incredible pieces of artwork! Gen Con Costume Contest Reminder! Just a quick reminder that this is your last chance to start getting things ready for the Third Annual Paizo Gen Con Costume Contest! For more details, you can always refer back to the official announcement, but the short version is that if you come by the booth during Gen Con wearing quality Pathfinder cosplay, you've got the chance to win both cash and cred from the Paizo staff. So bust out those sewing machines and start working! 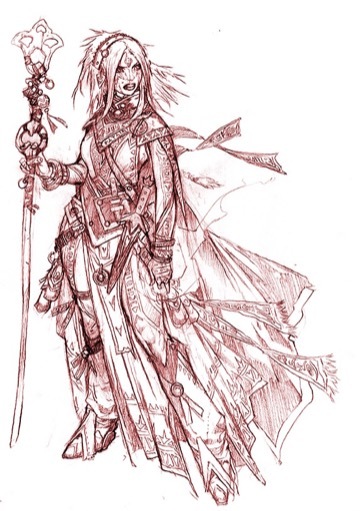 Now, since no blog would be complete without art, here's Jenny Poussin as Seoni, her costume courtesy of Paizo messageboard regular Laithoron. It's unclear whether their powerhouse partnership will actually be competing this year, but at the very least they should give you some inspiration. The Gen Con Costume Contest is Coming! With PaizoCon just a few days away, some of you reading this blog may be thinking, "Man, I can't believe I can't make it to Gen Con and PaizoCon this year. The world is so unfair!" Here's the deal: At some point during Gen Con, you show up to the Paizo booth dressed in your best Pathfinder costume. (That means monsters and characters with obvious ties to Golarion itself, not generic cosplay—that wizard hat could be from anywhere.) In addition to drawing a crowd of happy gawkers, the contestants will have their pictures taken by whatever staff members are handy. Those folks with the best costumes, as decided by us, will end up on the Paizo blog once we return from Gen Con, at which point we'll allow the posters on the messageboards to pick their favorite. What criteria that mad and merry crew will use is anybody's guess—creativity? recognizability? skin-to-clothing ratio?—but whoever they select as the best Pathfinder cosplayer will walk away with 50 dollars in store credit! But more importantly, the winner will go home knowing that he or she (or they, if folks want to team up to make a life-sized linnorm) have entered the exclusive cadre of the Paizo Cosplay Winner's Circle. With most of the Paizo editorial staff being transplants from across the country, the holidays tend to be the one time of the year where we put aside talk of goblins and statblocks and deadlines for a few days (or at least try to). With much of the crew making treks across the country to spend a few days with much neglected family members, things might get a little spotty here on the blog up through the New Year. Even with the dedicated folks staying behind to man the walls, the holiday fever can get a little distracting, so to tide things over till January 4th, here's Eva Widermann's fantastic artwork for our 2009 holiday card. But that's it from us for 2009, everybody! Thanks to everyone for an incredible year, and do me a favor and yell at James Jacobs if you see him on the boards over the course of the next week. Happy holidays from all of us here at Paizo and we'll see you in 2010! It's already starting to feel like a ghost town here at Paizo headquarters as the majority of the staff packs up and heads off for Gen Con Indy. With the debut of the Pathfinder RPG, we're totally excited, but also expecting the convention to be four days of absolute madness. So what are we doing? Oh, we're adding fuel to that fire, of course! There's already going to be tons of opportunities to get Paizo swag just by stopping by our booth, but in addition to the Pathfinder RPG, the annual Paizo delve, tons of Pathfinder Society Events, and way more, we're adding buttons! That's right, special, collectible Gen Con '09 Pathfinder Buttons. For as long as they last on Thursday, Friday, and Saturday, we'll be giving away a different button, allowing you to show your love for the grim gray maidens, those madcap goblins, or the lovely Seoni. So hurry on over to the Paizo Booth (#2312) every day to pick up the whole set! And that's it! We're off. We'll see you all at Gen Con Indy! Howdy Paizonians! As you may have noticed, there's been a dearth of blogs lately. You can blame that on the Pathfinder RPG Bestiary, as almost all of the editorial staff (including the interns) are furiously working on getting the Bestiary ready for release and ensuring that other projects (such as the one that bears this cover!) stay on schedule. It's a busy and exciting time, but it means that blogs may be sparse for a little while. Still, Hank and I will do our best to make sure that you have something new to enjoy every day (or almost every day) here on the blog! In the meantime, here's some art! Enjoy Jesper Ejsing's awesome cover for Pathfinder Adventure Path volume #24: The Final Wish, in which a poor sitarist is skewered by a brass golem's sword. The Pathfinder Roleplaying Game Core Rulebook is set to release on August 13th, 2009, and in anticipation, we are releasing a preview of the game each week until the game hits store shelves. This week, we are taking a look at Seoni, the iconic sorcerer. Starting off, Seoni has a few precast spells, whose effects are already calculated in as part of her stat block, including an extended shield, mage armor, and stoneskin. She could increase these protections with haste, mirror image, and resist energy if given a few rounds to prepare. As a sorcerer, Seoni can choose from one of ten different bloodlines. We chose the arcane bloodline, which is the default bloodline for existing 3.5 sorcerers as it is the only bloodline that grants a familiar. All bloodlines grant a number of bonuses as the sorcerer gains levels, such as additional spells known (Seoni receives identify at 3rd level, invisibility at 5th level, dispel magic at 7th level, and dimension door at 9th level), a bonus class skill (Seoni receives a free Knowledge skill of her choice), and a number of special bloodline powers (which we will talk about in a bit). New to the final version of the game is bloodline arcana. Each bloodline now grants a special bonus to a specific group of spells. In Seoni's case, any time she casts a metamagic version of a spell that increases the level by at least 1, the DC of that spell increases by +1 (total, not per level increased). This means that if Seoni casts a still lightning bolt the DC to halve the damage is increased to 21. Other bloodlines grant similar abilities. For example, the destined bloodline grants the sorcerer a luck bonus on saving throws for 1 round whenever she casts a spell with a range of personal. In addition to the arcane bond ability (which allows Seoni to have a familiar), the arcane bloodline grants two additional abilities. The first is metamagic adept, which allows her to cast metamagic spells without increasing their casting time. At her current level, she can use this ability twice per day. It should be noted that quicken spell has been changed to allow sorcerers to use it without increasing the casting time, meaning that Seoni can save her metamagic adept ability for extended and still spells. The second ability is new arcana, which grants Seoni an additional spell known (she chose stoneskin). If we were to continue to advance Seoni, she would receive a school power at 15th level, which would grant her a +2 bonus to the DC of all spells from one school of magic. At 20th level, she would undergo an arcane apotheosis, which would allow her to cast any metamagic spell without increasing the casting time and allow her to burn spell slots to power magic items that expend charges. Moving on, we get to Seoni's spell list. There have been a few changes to some of these spells, mostly to make them simpler to use, but in some cases to increase their power a bit. Ice storm, for example, deals the same amount of damage, but now also includes an effect that makes the area difficult terrain and imposes a penalty on Perception checks. Of all the spells in the game, none has the power to bring things screeching to a halt faster than dispel magic. Not only did this spell take a while to adjudicate, it also forced the target to recalculate a host of statistics if the spell was particularly successful. Now dispel magic requires only a single caster check, and the result is applied to all the spells active on the target. It dispels the spell with the highest caster level that it can affect. While this reduces its power a bit (although it no longer has the +10 limit to the check), it makes the spell a whole lot easier to use. Greater dispel magic still allows you to strip off multiple spells, but it too only requires a single check. It dispels one spell per four caster levels, taking out the spells with the highest caster level that it can effect. I should note that you can still use either one of these spells to target a specific spell to end that effect, allowing you to try and knock out the enemy's fly or stoneskin when it really counts. Mirror image has also received a bit of a facelift, making it simpler to use. Take a look. I also want to take a moment to talk about Seoni's staff of fire. Like the previous rules for staves, Seoni can cast all the spells in the staff using her caster level (10th) instead of the staff's, which is only 8th. She can also use her Charisma modifier and feat bonuses when calculating the save DCs. Staves in the new rules contain a total of 10 charges, but they can be recharged. Once per day, Seoni can expend a 4th level spell slot (the highest level spell contained in the staff of fire) to add 1 charge to the staff. Most of the staves have been rebuilt to work within these new rules. That is about all for this week. Next week Harsk comes stomping on to the stage as we take a look at the iconic ranger. I hear he has favored terrain (the internet), so we better watch out! Back by popular demand, the second in our line of Wayne-Reynolds-designed iconic characters is the beautiful and mysterious sorceress Seoni. Unlike the barbarians-gone-native on the eastern plateau or the colonial Chelliaxian immigrants of the south, Seoni is a native Varisian, a nomadic race whose closest real-world cultural analogue is the Romani. Or at least, she's mostly Varisian—as might be apparent from her otherworldly grace, there's something not quite human in her ancestry. Though she doesn't have any hard facts, Seoni herself has picked up on some of this, and is constantly pushed to search deeper into the mysteries of her heritage by strange dreams that she doesn't understand. More than just ornamentation, Seoni's runic tattoos play a large role in her personality. Coming from a people where tattoo magic maintains a strong following, hers are simultaneously a manifestation of her power and a tool to aid in her castings. The sheer number adorning her skin, as well as the similar patterns woven into her clothes, are a mark of status among her tribe, though many of the so-called "civilized" residents of Varisia look upon such body modification with distaste. Despite being a consummate adventurer, Seoni is something of an enigma to her compatriots. Quietly neutral on most matters, bound by codes and mandates that she rarely feels compelled to explain, the sorceress keeps her emotions tightly bottled. Extremely detail oriented—what the more pugnacious members of her party call a "control freak"—Seoni is a careful and meticulous planner, a schemer who frequently finds herself frustrated by the improvised plans of her more impulsive companions. Despite all of this, Seoni has stuck by her comrades through numerous tight spots, a fact that continues to amaze and confuse Valeros, who wonders loudly (although not altogether unappreciatively) about "the witch and her schemes." As with so many things, however, if Seoni understands her motivations, she's keeping that knowledge to herself. 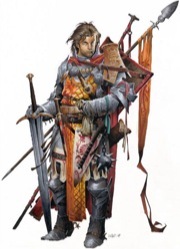 Seoni, along with the rest of the first four iconics, makes her debut as a pregenerated character in volume 1 of Pathfinder and D1: Crown of the Kobold King.